Welcome to Nutrition BEST Gardening! At Nutrition BEST, we're working to make healthy food and healthy lifestyles available to everyone. On this page you will find projects, ideas, and resources for gardening with kids of all ages (even the very youngest!) Watch for fun gardening activities coming to your Early Head Start, and let's grow together! Plant a Container Vegetable Garden — great for small spaces! Container gardens are perfect for balconies, patios, or places where you can't plant in the ground. You'll be amazed by how much you can grow in just a couple of pots! Plant a Windowsill Herb Garden — one of the easiest ways to get started with growing things. Kids can pick out fragrant herbs, like cilantro, basil, mint, and thyme, and plant them in a small window box. Herbs are a great introduction to gardening — they're sturdy and don't need as much light or attention as many other plants, and you can keep them on a kitchen window to add fresh-picked flavor to meals! Grow A Sunflower House — A fun and easy project for kids of all ages! Plant your own secret hideout with different varieties of sunflowers, then watch as birds, butterflies, and honeybees enjoy the blossoms. Grow Your Best Fall Garden Vegetables — A great resource for planning and planting a cool-weather garden brimming with broccoli, kale, peas, carrots, and more! 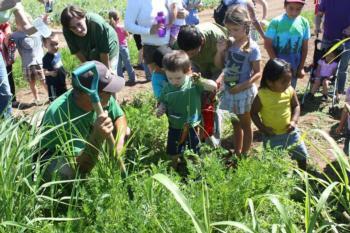 KidsGardening.org: Family Gardening — Activities, "how-to" projects, ideas, and more for gardening with children. KidsGardening Parents' Primer — Learn how to make gardening fun for kids of all ages, spot learning opportunities, and turn your kids' questions into fun discoveries! The National Gardening Association: How-To Videos — Learn about planting, pruning, pest management, and more with these informative free videos. Peaceful Valley Farm Supply: Organic Gardening Resource Center — This local, organic-focused farm and garden supply has a wealth of informative videos, articles, and even recipes on their web site. Square Foot Gardening — an easy, effective method to grow a garden just about anywhere! A "square foot" garden is especially good if you have poor soil or a small area in which to plant, and it is easy even for beginners. Free Nutrition BEST Gardening newsletters here! Each issue is packed with gardening tips, fun projects, and educational information. Gardening promotes a healthy lifestyle! Tasks like digging, planting, and harvesting vegetables are a great way to get kids active. Even very young children can help by watering plants with a small watering can, or digging or raking soil with child-sized tools. Gardening also teaches important lessons about nutrition and where our food comes from — and even kids who don't like veggies often get excited about eating the ones they've grown themselves! Gardening brings families together! With hectic schedules and busy lives, it's more important than ever to make time for family activities. Kids, parents, grandparents and friends can all work together in the garden — there are things for everyone, young and old, to do and learn. A garden is a great way to continue or even start family traditions; children can learn to plant seeds from parents or grandparents, older kids can teach younger ones, and you might even be surprised when your child points out an insect that you wouldn't have noticed! Gardening is educational! A garden isn't just a place to grow tasty fruits and veggies — it's also a hands-on classroom. In the garden, kids learn about plants, insects, nature and science, as well as curiosity, teamwork, and problem-solving. A plant needs care and attention to thrive — if you neglect it, it will wilt and die. Fortunately, though, plants are resilient (unlike hamsters!) and will usually spring back with a good watering. Children learn important lessons about responsibility from tending a garden… and a harvest of delicious fruits and veggies is the best reward! Gardening is economical! 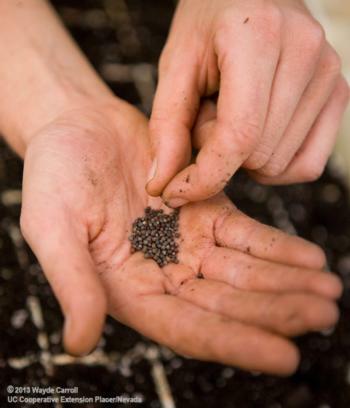 Plant starts and seeds are inexpensive, and garden beds can be built with recycled materials. With a bit of work, your garden will produce delicious fruits and vegetables all year long, saving you money and trips to the grocery store!